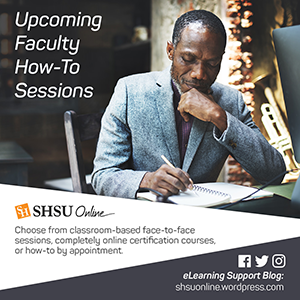 If you teach online at SHSU, then you are familiar with the effort, energy and involvement it takes to engage with your students in that environment. If you’ve taught online for more than a few semesters, then you know that you do need to put some thought into your transition of teaching a class from semester to semester. Thought goes into your course materials, learning objectives and how your class is setup in Blackboard. Ask any online instructor, course builder or instructional designer and they can probably give you an extensive checklist of items to pay attention to before the semester starts. This blog post however will cover only our take on the Top 5. Check Blackboard course content availability and due dates.